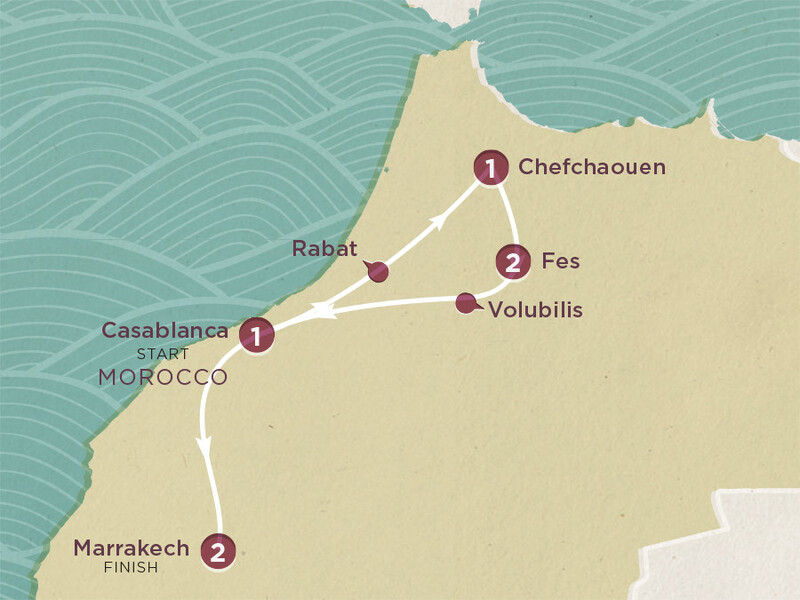 Ticking off Casablanca, Fes and Marrakech in just seven days, this Moroccan adventure totally rocks the kasbah. Prepare for opulence overload at the Hassan II Mosque, photo ops aplenty at the Hassan Tower in Rabat and as many walking tours as your feet can keep up with. Ready to rock and roll? Let’s go! What’s uppppp Casablanca! Welcome to Morocco’s most populated city, where Art Deco meets mosaic and modern street art meets sacks of saffron and cumin. Dump those bags and join the group ‘cos this trip kicks off with a bang. We’re off to one of the largest mosques in the world – the Hassan II. Want a travel experience to write home about? Trust us, you’re on the right trip. Ready to rock out, Morocco style? You got it. Today we’re heading to the most Instagrammable location ever: Chefchaouen. But wait! First, we’ll make a pit stop at Rabat, the country’s capital. Grab your phones – you’re gonna want to Snapchat the Hassan Tower, a landmark and major city attraction dating back to 1195. Impressed? Thought so. Brace yourself for medinas, mazes and mausoleums – today we’re missioning it inland to Fes. But first, enjoy a tour of Chefchaouen courtesy of yours truly. Get your Insta game on as we stop for snaps of some vibrant white and blue cobbled streets that give Mykonos a run for its euros. One last stop before Fes. History lovers – rejoice! We’ll be stopping off at Volubilis to see some ancient Roman ruins. This morning there’s a city tour with your name on it. Did you know Fes is one of ten cities in the world that’s officially classed as a UNESCO World Heritage Site? You do now! Spend your free afternoon exploring like a pro. Anyone for an optional hammam visit or dinner show? That’ll be a yes. Say hello to your drive day! Today we’re hitting the road to Marrakech. Hey, they don’t call this the Rockin’ Moroccan for nothing! Who’s a Marrakech master? You are! Well, you will be after our awesome city tour. Check out the Saadian Tombs and the Bahia Palace, then find things you never thought you needed in Jemaa el-Fnaa Square. Once a trading post for slaves, ivory and gold, now it’s home to colourful characters selling everything from spices and leather to medicines and food. Let’s play a game – what’s the craziest thing you can find for sale? Wahhhhh! It’s time to wave goodbye to your Moroccan mates. Swap Insta handles – you officially sign off from Topdecker duty after breakfast.